Update: Anthony advises that it wasn't him who took a swipe at creationists, it was an emailer called Robert Scheaffer. Anthony just provided links to his Marcott protests etc (which I've improved upon by linking to better articles). Anthony says he is off at a "conference" organised by the fake oregon petition crowd. The meeting has a very mixed up line-up of speakers and topics, ranging from climate science denial to silicosis denial and lots in between - mostly the crank end of right wing ideology from the look of it. Anthony Watts went away for a couple of days and all he left his audience was an open thread that fizzled out slowly along with one of their new/past heroes, ending up with a few posts about "energy can be made out of nothing" (aka the E-Cat hoax). Perennially Puzzled Bob Tisdale wrote an article about current sea surface temperatures, in which he said nothing except the ocean warms by magic and there's a colder than normal patch somewhere. WUWT was so slow that even Bob's article has earned him 43 45 comments. Wondering Willis tried to do his bit with a third or is it his fourth post in as many days complaining about the carbon tax in British Columbia and showing that the 6.67 cents/litre carbon tax on petrol (around 5%) hasn't prevented British Columbians from driving their motor cars altogether. Though it does seem to be helping reduce carbon emissions. Time to get the mob stirred up, thought Anthony. There has only been one this week and few this month, so maybe I'll give the lynch mob a bit of a lift by having another Mann-bashing session. The Amazing Mann just told TAM (The Amazing Meeting of the Skeptics Society) that there has been no pause in Global Warming, and says claims that there has been are just ‘Cherry Picking’. Also he used Marcott et al. as proof that his Hockey Stick is valid. Surely he must know that the authors themselves disavow that conclusion!! Like a creationist, he uses arguments he knows to be false, but the audience doesn’t. Anthony is wrong, of course, as usual, as ever. 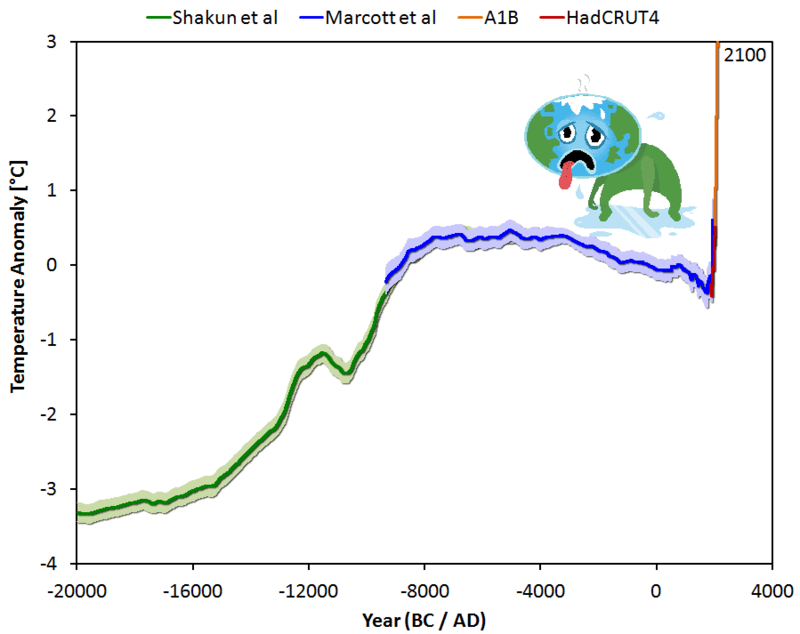 The hockey stick is valid and was further validated by numerous other reconstructions including Marcott et al, and the modern record - and every new reconstruction continues to confirm it. Anthony manages to take a swipe at the intellectual capability of attendees at this year's The Amaz!ng Meeting as well as get in a thirty-something'th protest at Marcott et al, (along the way implying he also doesn't accept any of the modern datasets that use the instrumental record of global surface temperatures). Marcott et al (2013) Globally stacked temperature anomalies for the 5° × 5° area-weighted mean calculation (purple line) with its 1σ uncertainty (blue band) and Mann et al. 's global CRU-EIV composite mean temperature (dark gray line) with their uncertainty (light gray band). However, back on WUWT the world's 8% Dismissives gather to deny all the signs of global warming. Anthony gets the reaction he's looking for, with words like "delusional", "lying", "fiction", "fantasy" and some rather ugly terms that are allowed on WUWT but only if you are a science denier. His thread brings out the diversity of his followers - ranging from right-wing extremists, Christian fundamentalists, run-of-the-mill illiterati, "Ice Age Cometh"-ers through to "I don't understand it but I know what I (don't) like" ordinary old science deniers - who at least know how to toss out ad homs when Anthony tells them to. July 13, 2013 at 4:15 pm What is going through his head when he says things like that? Does he think the pause is a temporary blip, that all he has to do is bluff it out until it ends? July 13, 2013 at 4:35 pm It is remarkable that he sticks to his fiction/fantasy in the face of facts and data. I guess he’ll be the last one left on AGW ship. July 13, 2013 at 4:36 pm If we don’t feed the monkey, won’t it just throw feces at us? July 13, 2013 at 4:49 pm With fingers in ears, shouting “Nya nya nya, I can’t hear you”, he denies the reality. Would this classify him as an evildoer denier? July 13, 2013 at 4:30 pm He’s a buffoon… nothing more, nothing less. He leaps and squeals for a banana. Don’t feed him, you’ll just encourage him. July 13, 2013 at 8:23 pm The Randi Forum is anything but skeptics…..it is basically Media Matters for global warming fanatics. July 14, 2013 at 6:20 am Two famous makeup artists of fakery, Mann & Randi together on the same picture, Coo! July 14, 2013 at 7:48 am Funny how Randi loses his skepticism right when he needs it. Like Phil_dot, Carl Sagan & others. July 14, 2013 at 8:41 am Is it just me? Every time I see that Mann-mug, I want to punch the crap out of it. July 14, 2013 at 9:46 am beng: It’s not just you. July 13, 2013 at 5:58 pm @Larry Hamlin - And don’t forget the land temps are all UHI-affected and therefore falsely ovewrstated. As for Mann being the last one on the sinking ship, let’s don’t forget that hatemonger der Fuehrer and his satraps at the hate-group EPA can do a lot of damage yet before they are brought down. And no matter who else deserts the ship, der Fuehrer can’t leave it because it is the entire basis for his campaign to destroy the economy and along with it civil liberties. July 13, 2013 at 4:24 pm Tap dancing waiting for proof which never comes. The sign of some one desperate to have his dogma accepted as proof which flies in the face of empirical evidence. Pretty sad that he continues to discount real world evidence and instead demands that his belief in a failed set of models is all that is needed to change the entire worlds opinion. – Sir Boab Tree. July 13, 2013 at 5:32 pm Yep. I really enjoy some of the podcasts from many of the TAM’ers, including Brian Dunning and the Skeptics Guide To The Universe crew. But, yeah, when they turn to the subject of global warming…. Mann oh Mann…. That IS a huge blind spot. They were glowing over the Cook / Lewdowski (whatever his name is – if correct statistical methodologies are not important to him…. his name is not important to me) studies without really digging in to examine what the problems with the studies are. They bought the “Skeptical Science spiel hook, line, and stinker. It’s sad, because there used to be one guy on the Skeptics Guide panel, Perry, who was very skeptical of the alarmist side of AGW. But, unfortunately, he passed away several years ago. he is sorely missed. 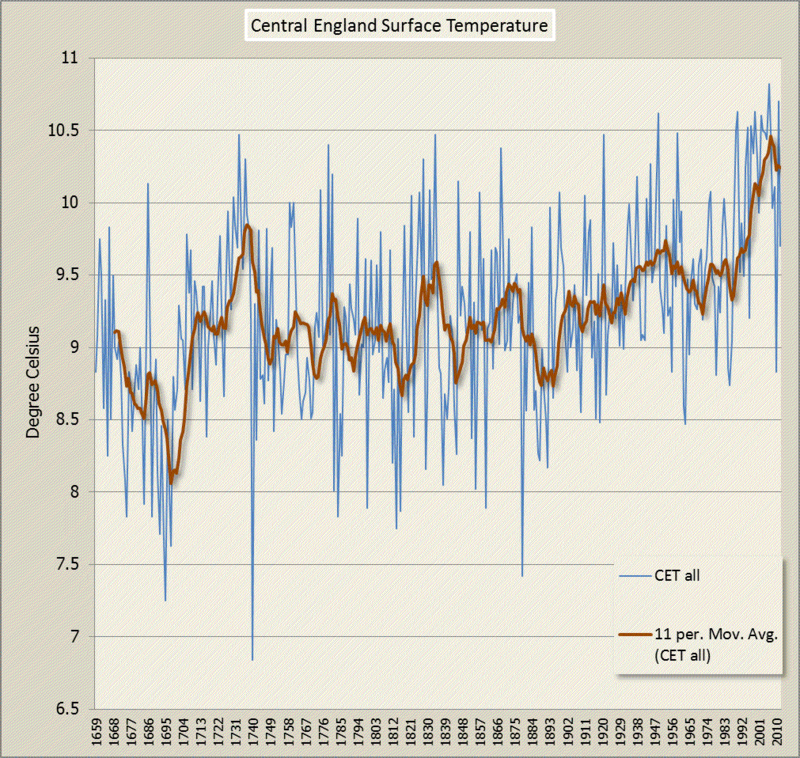 July 13, 2013 at 4:49 pm Even the NCDC shows a -0.02°C/Decade trend since 2001 to 2012. 11 years of very slight cooling. July 13, 2013 at 5:00 pm “Like a creationist, he uses arguments he knows to be false, but the audience doesn’t.” Anthony, I must protest. Any creationist in particular? Any argument in particular? This seems an overgeneralization and, well, a cheap shot. July 13, 2013 at 5:13 pm Like a creationist, he uses arguments he knows to be false, but the audience doesn’t. Umm, people of faith can also believe in properly researched science. Many support your endeavors. Maybe a poor analogy. July 13, 2013 at 7:55 pm Agree with Don and Alvin. Was your creationist jab really necessary? July 13, 2013 at 8:04 pm I’m not a creationist but was taken aback by Anthony’s stereotype as it seemed so out of character. My first reaction was to recheck the byline to ensure the post was from Anthony and sure enough it was. What gives? Bad habit to fall into, my friend. July 13, 2013 at 7:56 pm We all know “Climate Change” happens (the climate is always changing) and we all know “Creation” happened (we’re here aren’t we), we also know both were/are highly chaotic un-modelable events. @Don says: July 13, 2013 at 5:00 pm, I’m a creationist like Don. July 13, 2013 at 7:17 pm I’m a geologist. I think Mann is a cheat and a fraud and a disgrace to the profession (he wears one or two geology degrees). And since no one else can explain it, I believe the Bible account of the formation of everything at the outset. No one will ever disprove it. The rocks don’t go back that far. Don't worry - it's only the land that's warming? 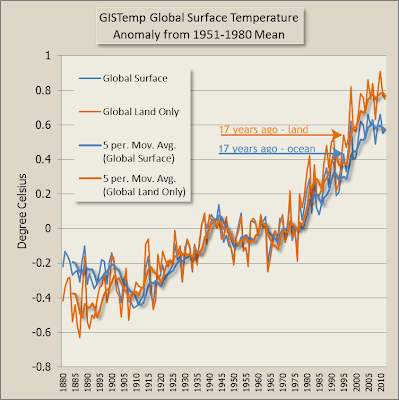 July 13, 2013 at 5:42 pm Climate alarmists like Mann use only the land surface temperature record and ignore sea surface temperatures which when both are combined represent the global surface temperature record. 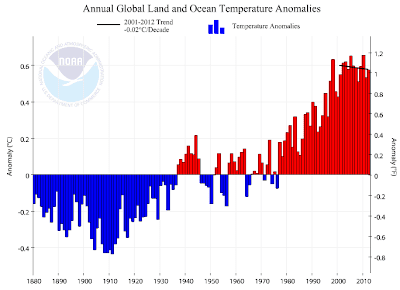 The global surface temperature record shows the pause. 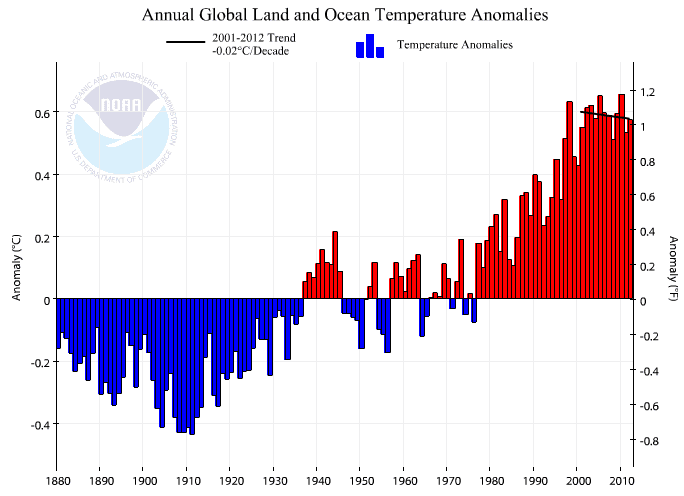 The land surface record continues increase and that’s all the alarmists need. Alarmists also frequently site the Berkeley Earth project land temperature record as further proof there is no global temperature pause. This is how the ignore the pause game is played. 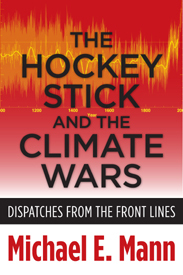 July 14, 2013 at 11:04 am Mann’s “cherrypicking” claim regarding the warming pause (now 17+ years) is of course just another one of his multitude of lies he tells. But hey, he’s got to make a living somehow. As Willis once Wondered, the land surface warms faster than the sea surface. Both are warming because of increasing atmospheric CO2. Most of us live on the land and rely on it for our food, shelter and clothing among other things. And there are many more signs that global warming progresses. July 13, 2013 at 6:27 pm I think our planet is always warming or cooling, always seeking but never attaining equilibrium. This present stasis seems to indicate a lack of net input for the self-regulated planet to react against. I watch for next El Niño or La NIña to emerge with some push, one way or the other. Afterwards, around a new level, some overshoot followed by dampening oscillations. This until the next plunge into an ice age. July 13, 2013 at 5:12 pm This “pause” in upward trend can be one of two things…A real pause that just lasted to long or; It shows the fact we have peaked in the larger cycle (thus the longer period) and we are now headed in the reveres trend… the top of a large sign wave is always longer in time period. The fact we have long since left the normal short cycle trend lines would lead me to believe we are going to get much cooler as we have begun the downward trend to the low part of the larger natural cycle. 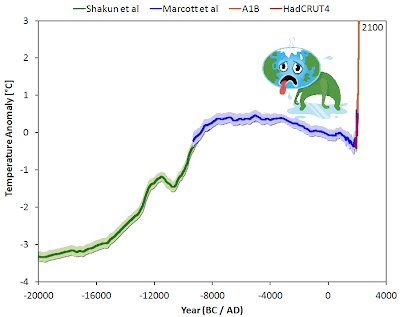 The authors of M. et al actually said that their reconstruction was indistinguishable from some of Mann’s, and there are many other modern-reaching reconstructions that have confirmed the hockey stick. 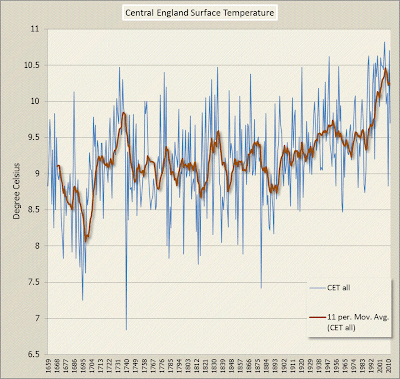 If you want to throw out the relative uniqueness of the modern temperature spike, you have to do stupid things like assuming CET is representative of global temps. I do appreciate your acknowledgment of creationists as the bottom-feeders of even the pseudoscientist community, but how do you think Denning and Spencer are going to take that? As we've seen from the above, Anthony Watts and his motley lynch mob linger on as a disparate rabble of creationists, "Ice Age Cometh"-ers, right wing extremists and scientific illiterati, continuing to deny and rail against global warming. Is there such a person as a reasonable "fake skeptic"? July 14, 2013 at 10:21 am A good bit more ad hominem than I’m used to seeing on this site. Unfortunate. July 14, 2013 at 10:57 am Mike….calling a pathological liar and con man just that is not ad hominem. Well finally something I can agree with Anthony on. Creationists do cherry pick data, misrepresent and misquote scientists, misunderstand the science, create false debates, ignore basic physics, lie and cheat. The thing Anthony got wrong was failing to recognise that it is the climate science deniers, his side, that does this. Priceless. I find it funny how one set of deniers thinks all the other sets of deniers are deniers but they aren't. Reminds me of the story of one 'ghost rider' on the German Autobahn (somebody going opposite the stream due to a wrong turn at a junction; shouldn't happen but does) who heard over the radio a warning that a ghost rider had been seen around where he was... his reaction: "nah... hundreds of ghost riders". Those comments are really amazing, we should store them well for future historians trying to understand this age. WUWT is becoming more and more a bathtub for extremists. Even Anthony Watts seems to have noticed and tries to discipline his followers. First there was a funding proposal, with was barely hidden criticism of the WUWT comments. However, that was probably too subtle for this crowd. Then we had Anthony going to the trouble of making an experiment to proof that CO2 can warm the Earth's surface, trying to make his followers stop making stupid claims that greenhouse gases cannot warm the Earth. And now he tries to get rid of the creationists in his ranks. Still it looks like the more moderate people run away faster as the extremists. The tone on WUWT is getting more shrill and bizarre every day. On one of the delusional threads about Salby and his deserved sacking, a commenter made reference to lynchings and another to the reduction in crime due to concealed weapons. Jan Perlwitz got the full force for calling out the comment about lynching and got it in the neck from Watts who tolerates threats from his mates and sees them from the other side. What a hypocrite! I suspect his support will dribble away as genuinely nice people get fed up of the nastiness the deniers serve up on an hourly basis. Oh my, that "creationist" jibe was a slip-up. They're being gentle with him, of course; dear Willard, none too bright but his heart's in the right place, you have to make allowances. All the same it must be wounding, a wound the Sky Dragons might aggravate. Is it the case that in his update2 Watts has admitted that his entire post was plagiarized from an email and put up without attribution? Or could it be that the person who sent him the email didn't want to be identified? Watts doesn't seem to understand a few points of basic ethics, does he? I think at least one person will wonder what he agreed to. Franklin Chang Diaz has been quite clear on climate change and other forms of environmental protection. He might feel a bit, ehm, out of place for many of the lectures...I know, he's likely not present for those lectures anyway, being the banquet speaker, but still.